May play even more ironic on the small screen. Director's commentary is very informative (great tidbits about casting, costumes, photography, the use of the criminals' video). Getting inside his head actually takes the movie up a level. I like it better after watching w/commentary. Includes optional InfiniFilm features, which when turned on allow you to click on short, informative extras during the film. This is next-gen DVD stuff. "True Tabloid" featurette of Jerry Springer and his ilk trying to justify themselves. 21-minute roundtable discussion (shot like a cheesy tabloid show) about crime and fame with sleazy attorneys and Mark Fuhrmann, the cop who lied in the OJ Simpson trial. Actual raw footage shot by the actor playing the video-obsessed criminal in the film. Deleted scenes w/commentary. Trailer. Bonus material is in wide-screen. Any real DVD aficionado has to love that. Somewhere between a buddy-cop potboiler and a blunted, commercialized "Natural Born Killers" lies "15 Minutes," a slick, violent thriller with an acerbic statement to make about media sensationalism. 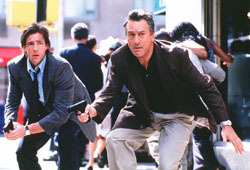 Hard-drinking, cigar-chomping celebrity cop Eddie Flemming (Robert De Niro) and bristly, business-minded arson investigator Jordy Warsaw (Edward Burns) are on the trail of a pair of Eastern European criminals who have hit New York in pursuit of the new millennium American Dream: Get as famous as possible as fast as possible. How? By videotaping a killing spree and selling the tape to tabloid TV. Yes, the plot just screams "gimmick!" and writer-director John Herzfeld ("2 days in the Valley") lays it on thick, like when the killers go to dinner in an upscale restaurant that shows their tabloid program on a wall-sized TV while snooty diners sip champagne. As if! But I'm getting ahead of myself. How did two grimy Slavic thugs even end up in this fancy joint arguing like spoiled stars over who gets credit for their video being show on the wall behind them (one of Herzfeld's many dark humor touches)? Fresh out of prison, they came to America to collect money owed them from the heist that got them busted in the first place. The burly Oleg (Oleg Taktarov) -- a brutal but childish 250-pounder with strangely wide-eyed daydreams about becoming famous -- steals a camcorder almost as soon as they arrive in New York and never stops taping. Herzfeld is a little too enamoured of such improbable contrivances, but in the era of "Survivor," "Blind Date" and the XFL, the incredibility of these characters doesn't seem quite so far-fetched. Homicide cop De Niro and firebug Burns reluctantly join forces at the scene of the killers' first crime -- the double-murder of their former associates, which they tried to cover up by torching the place. Burns ("Saving Private Ryan") is his usual stoic self, which works for his role and De Niro could convincingly sleepwalk through his part as an unflappable cop. But he makes an effort here to lend Eddie Flemming more character than was probably in the script. In one of the best scenes in the film, he practices proposing to his TV reporter girlfriend -- which may sound like a movie cliché until you see De Niro do it. Of course, the very fact that the cop is in love -- not to mention in love with a journalist covering the crime spree -- means somebody is doomed. But Herzfeld is very deliberate (sometimes too deliberate) about deviating from the expected formula -- even as Burns romances a frightened witness and De Niro gets kidnapped by the killers. The film is blessed with other good performances, like Kelsey Grammer as a greasy tabloid TV personality, and seasoned with heavy dollops of the director's sardonic, ironic humor -- both of which help make up for some of its shortcomings. But Herzfeld is overly self-indulgent, forgiving himself for falling back on trite and ridiculously staged moments, like the restaurant scene and the action movie shootout finale, because he's convinced he's being so very, very clever the rest of the time. In fact, it's the other way around. Crafty strokes of dark comedy and self-awareness peek through what is largely a Hollywood-gritty veneer. Herzfeld edits "15 Minutes" to a hip, energetic beat, and as you might expect he cuts to Oleg's footage way too much. Ultimately his vision of cop-movie-meets-cool-social-satire does emerge intact and somewhat amusing, but it's not nearly as deft and cogent as Herzfeld imagines it to be.